"I've used the Doggie Spa in HB for years... the owner is great, prices are fair, and I don't know what I would have done without having this place... it's that awesome." "The Doggie Spa treats our "Beach Max" (guess how much sand that is in a one hundred pound Golden Retriever) like family. He loves going there and we love the amazing staff!" "Stella loves going to the spa and I love it too, she comes home smelling and looking like a princess!" "Our dogs loves going to the Doggie Spa. They love the people and the atmosphere. They look beautiful and smell great after their baths. Thanks to all of you." "Turbo definitely likes Doggie Spa better than the home shower!" "Max loves going to Doggie Spa. The staff really knows what he needs and how to take care of him. He feels the love and is always happy to go!" 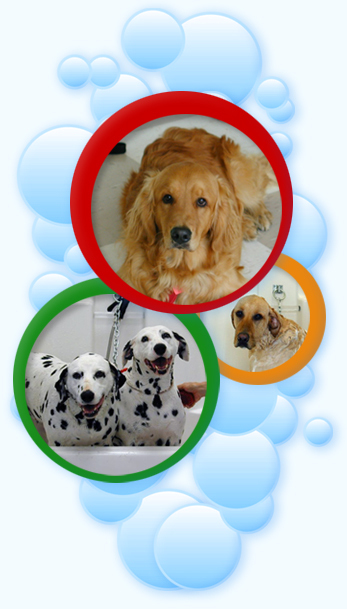 "The Irvine Doggie Spa take excellent care of Bailey & Maggie, and a person can tell they really "love" their clients..."
"Duke loves getting a bath at the Doggie Spa!" "LOVE the Irvine Doggie Spa. They make my Golden Retriever and Yorkie look fabulous!" "They take really good care of my 15 year old Welsh Corgie and my 4 year old Yellow Lab." "Mr. Fuzzy Britches ONLY gets groomed at the HB doggie spa and thanks you!" "I love the Doggie Spa in Huntington Beach. Just $15 and you can wash your dog there without breaking your back and my bathroom stays clean. You've gotta love that!" "Butters loves his baths at the Doggie Spa and looks at me as if I'm crazy when attempting to bathe him myself! You spoil him, and we appreciate it!" "The Doggie Spa is Great! Great staff. My dogs come home looking and smelling wonderful! I highly recommend The Doggie Spa!"